Cataracts are a clouding of the lens that inhibits proper vision. They are related to aging and around half of Americans over 80 have experienced them. Cataracts can affect either eye and are usually noticeable to the patient in the sixth and seventh decade of life. Some of the symptoms could be night vision glare or blindness, decrease color perception and decreased visual acuity. The lens is the part of the eye that is used to focus an image, but when it becomes cloudy the image appears blurry. As we age, protein can clump together behind the lens. This clump increases over time and forms the cataract. Initially, when the clump is small, vision is not affected, but over time vision worsens and becomes dull and blurry. Cataracts can also cause a discoloration of the lens – from clear to yellowish or brownish. This does not affect the sharpness of vision, but does eventually start to make it more difficult to read or perform other normal tasks. One interesting effect is that this discoloration can interfere with the ability to differentiate blues and purples. However, there are more than just age-related cataracts. Other kinds include: Secondary, traumatic, congenital, and radiation. Secondary cataracts are caused by things like glaucoma, surgery, health problems, or possibly steroid use. Traumatic cataracts are caused by injury and can take years to develop. Congenital cataracts are when infants are born with them or a child develops them. This usually affects both eyes, but can be so small that it doesn’t affect vision. Radiation cataracts develop after exposure to some types of radiation. Age-related cataracts can start in your 40s and 50s, although they generally do not affect vision until you are older – after 60. Certain behaviors or diseases seem to increase the risk, including: diabetes, smoking, drinking alcohol, or excessive sun exposure. To help prevent or delay cataract development it is recommended to eat a healthy diet (green leafy vegetables, fruits, and other foods with antioxidants), quit smoking, and wear sunglasses or a hat with a wide brim if there is significant sun exposure. 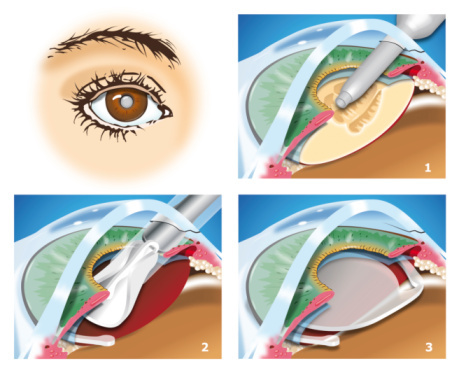 If a cataract does develop, surgery is the only effective treatment. Early on anti-glare sunglasses, new eyeglasses, brighter lighting, or even a magnifying glass can be used to manage symptoms. Once the cataract starts seriously affecting vision the individual and their eye doctor can discuss surgery. Fortunately, waiting does not cause eye damage or make the surgery more difficult, so there is time to study the pros and cons. Your optometrist will measure the maturity of the cataract at each annual eye health exam. They will discuss the different options with you and even explain how your vision might be corrected after cataract surgery. Cataract surgery is quick and relatively painless. Most patients are up and performing most activities the day after surgery. Visit our office if you have any concerns that you may be developing cataracts.